Year 5 listening to Prof McGinty. Year 5 today had enormous fun learning with Professor McGinty, about life in Ancient Greeks. They dressed up in costume, handled many Ancient Greek artefacts, listened to Ancient Greek music and learned many facts about the Ancient Greeks, as part of their current topic. A hugely entertaining experience for all! Thank you Professor McGinty! Year 4 at Kenilworth Castle. 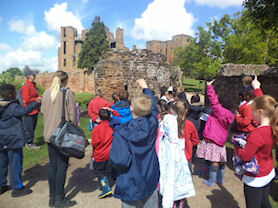 Year 4 visited Kenilworth Castle to enrich their topic of Castles and Monarchs. The children had to climb high up into the castle’s tower to see the special apartment built for Elizabeth I and also got to experience what life would be like for the rich ladies and lords in the great hall. The children really enjoyed learning about the lives of the people who lived in the castle and had chance to explore the Elizabethan Garden and the birds that inhabit it. 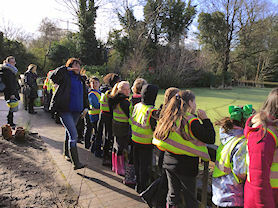 Year 4 observing the river. 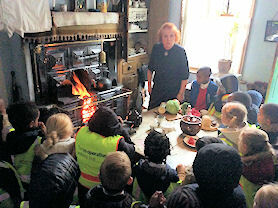 Year 4 visited Sarehole mill to enrich our Fire and Ice topic. The children had lots of fun exploring the woodland and bird watching. We all took part in a rivers session lead by our guide Natalie. The children got to observe and conduct experiments in the river, which they thoroughly enjoyed. We all learnt lots about the physical features of the river and mill pond. Year 5 at the Botanical Gardens. 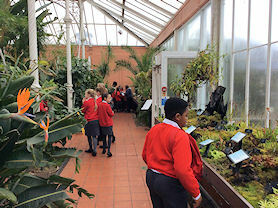 Year 5 visited Botanical Gardens, Birmingham and had an amazing time! The first Rainforest challenge was to find particular plants in the tropical house and sub-tropical house following clues. This involved working co-operatively in teams. After a quick lunch, we had a tour around the gardens which included some bird-spotting. 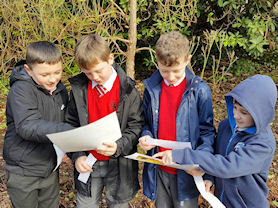 The final activity was 'Rainforest Revelation' which involved solving riddles to identify different trees and plants in the Rainforest. This then lead to a final Rainforest tribal dance with musical instruments made from different trees and plants from the Rainforest. A really super trip was experienced by all. Reception acting out the Nativity. Reception went to Polesworth Abbey on the 28th November. When we arrived we found out that the baby Jesus had just been born! We had to visit the taxman to pay our taxes and be counted. Then we got to go and see the real life baby Jesus with Mary and Joseph. We were so excited to see him! 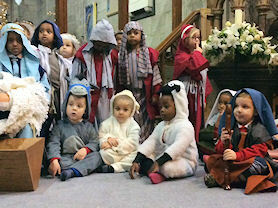 After that we got to dress up in different costumes and recreate the Nativity scene. Year 4 investigating the sea life. 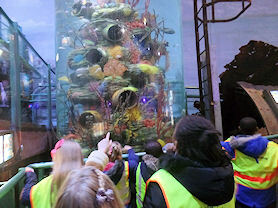 Year 4 visited the National Sea Life Centre in Birmingham to enrich our writing. We enjoyed seeing a variety of sea creatures including Beverly the Octopus, Molokai the Sea Turtle and even got the chance to touch a starfish. The children really enjoyed coming face to face with these fantastic animals and learnt about the dangers that face them in the wild. We will now return to school and create leaflets promoting the Sea Life Centre and encouraging others to help protect our oceans. Year 2 at the Buddhist Temple. Year 2 visited the Buddhist Temple as part of our topic on ‘Festivals’. Children learned how to meditate and found out more about the Buddhist traditions. They showed us artefacts and explained the meanings of them all. The children had the opportunity to ask questions and look around the Temple. Year 2 enjoyed their trip to the Buddhist Temple. Learning about rocks at the Thinktank. Year 3 had a lovely time at the Thinktank Museum in Birmingham. We attended a Rocks workshop and found out lots about types of rocks and how they are formed. PCSO Tracy with the children. 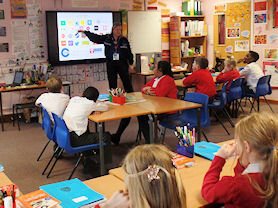 Key Stage 2 had an engaging and informing visit from our PCSO Tracy Baker. As part of Anti-Bullying week, Tracy came to teach the children all about stopping bullying by being ‘Kindness Superheroes’ and the children made promises to perform one kind act a day. Tracy also talked about cyber bullying, reminding the children not to give out any personal information to those they talk to in games and online. The children really enjoyed the visit and we are grateful as a school for these links with the wider community. Trying out the fire hose. Year 2 visited Erdington Fire Station as part of their topic on ‘The Great Fire of London’. We discussed how fire engines had changed. The children got to go on the fire engines and the firefighters showed the children all the different equipment on a fire engine. The firefighters explained how they find out where fires are and how to get there quickly. All the children and adults have a turn at using the hose. Some of the teachers had to dress up in the firefighter’s clothes and describe how they felt. The children learned lots about the fire service on their trip, through their interesting questions. Year 2 really enjoyed this trip! 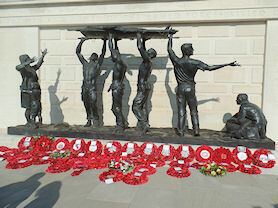 One of the memorials at the Arboretum. 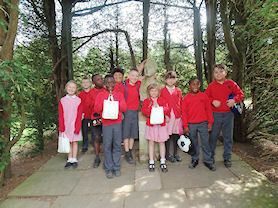 Year 5 visited The Arboretum which is a woodland landscape featuring 30,000 trees and a vast collection of memorials. The 150-acre site is a tribute to those who have served and continue to serve our country. 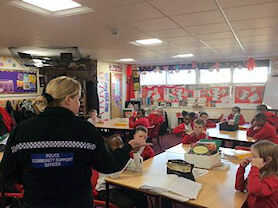 Year 5, initially enjoyed poppy activities and discussions about the meanings of the Memorial Arboretum and its significance. This was then followed by a tour around some of the most poignant memorials. It was a most interesting visit with many children commenting they would like to return! Enjoying a teddy bears picnic. 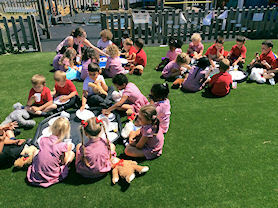 Nursery had a teddy bears picnic to celebrate the end of our bears topic. We brought our teddy bears in to school and shared food with them and sang teddy bear songs. Afterwards we played party games such as pass the parcel and musical statues. Year 4 asking questions at Aston Hall. 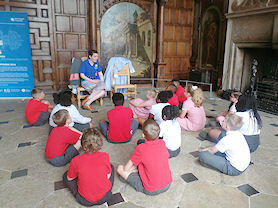 Year 4 visited the magnificent building and grounds of Aston Hall, one of our local tourist attractions. We took part in a workshop around the different rooms and parts of Aston Hall and talked about life in the residence. There was plenty of time for interactive activities and opportunities to ask our many questions. It was certainly a fun, fact finding learning opportunity for everyone! We even had the chance to write with a quill and design our own coat of arms. Year 2 enjoying being Roman soldiers. 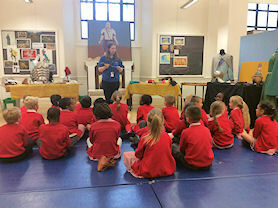 Year 2 visited Birmingham Museum and Art Gallery as part of our Seven Wonders topic. We visited the museum to take part in a Roman Soldier workshop linked to the Colosseum. The children got to live the life of a Roman soldier by practising marching, learning about their uniform and even being punished! The children thoroughly enjoyed practising shield formations and taking part in a victory parade. The beautiful grounds of Packwood House. 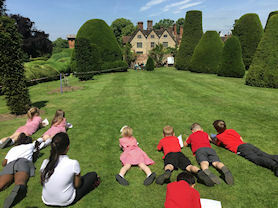 To enrich our summer term topic of plants, Year 3 went on a trip to Packwood House. The children loved their visit where they had the opportunity to explore the numerous manner lawns and walk around the beautiful lake. We the explored the kitchen gardens, where the children saw different fruits and vegetables growing and finally returned to the manner house to spend some time relaxing in the grounds and sketching the beautiful surroundings. Year 3 really loved their trip discovering nature and seeing a variety of different plants. Learning about the animals at the farm. 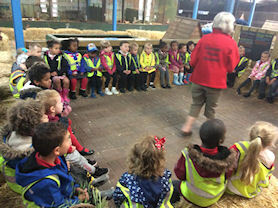 Nursery had a fantastic visit to Ash End Farm. We had the opportunity to bottle feed a baby lamb, feed the goats and sheep and look at the pigs and cows. We got to hold a baby chick and collect a fresh egg that had been laid and take it home. Our tour guide explained about the different animals and gave us lots of information. We finished our day with a picnic lunch in the play barn. Year 2 at Alexander Stadium. 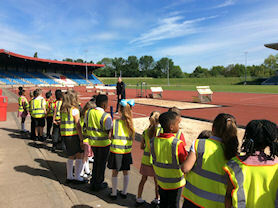 Year 2 went on a trip to Alexander Stadium as part of our Olympics Topic. The children enjoyed seeing the trophy cabinet and hearing about past and present Olympians to train at the stadium. A real highlight of the trip was being allowed to sit in the stands and even step onto the track where many athletes have trained and competed. We were lucky to have the perfect weather for the day and the children were really interested in the different events, such as relay, long jump and javelin. Year 3 at Alton Castle. Year 3 had a fantastic retreat day to Alton Castle. 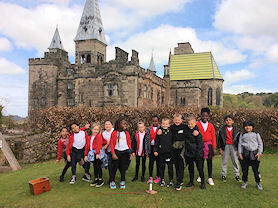 They took part in many fun team building games including; orienteering around the castle to find symbols related to their Holy Communion, working together to run a ball down open pipes and into a bucket, and finally spelling out phrases on a word search about Jesus. They enjoyed eating lunch in the sun with a beautiful view of the castle, and had a reflective meditation session where they had the opportunity to think about what receiving the body of Christ meant to them. Year 4 on their trip. As part of our Castles and Monarchs topic, Year 4 visited Kenilworth Castle, in Warwickshire. We explored the remains of the castle and learned about the different parts of the castle, including who lived there and what life was like living there long ago. Also, we had time to visit the beautiful Elizabethan Gardens and aviary. A fun trip which has helped bring our current topic to life! Enjoying our time at Cafée Ceramica. 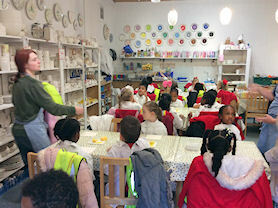 Year 1 visited Café Ceramica where we decorated tiles with cityscape images. We used a range of skills to paint, dab and stencil our tiles. We had a wonderful day and used lots of listening skills to understand the techniques we needed to use. We cannot wait to see our final pieces when they have been fired in the kiln. Thank you café ceramica for a wonderful day. Year 4 learning more about onine safety. 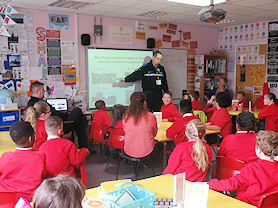 PCSO Tracy Baker visited Year 4 to discuss online safety. Different scenarios were explored and the dangers identified after watching a short clip. Year 4 learned how important it is to tell a trusted adult if anything is worrying them and not to give out any personal information. A worthwhile and valuable session. 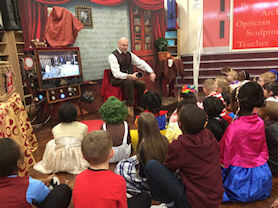 Professor McGinty entertaining and educating Year 3. Year 3 had a fantastic, fun visit from Professor McGinty all about the Romans. We learned lots of new facts, got the chance to observe and touch artefacts, as well we some of us dressing up! We found Professor McGinty hilarious and had a great learning experience. Year 4 at Sarehole Mill. 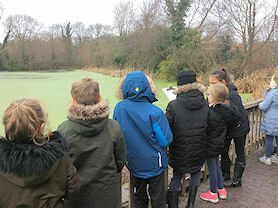 On Thursday 15th February 2018, Year 4 went to visit Sarehole Mill as part of their Fire and Ice topic and their work about the water cycle. Sarehole Mill is a working mill which is about 250 years old and Year 4 were lucky enough to see the water wheel in action. 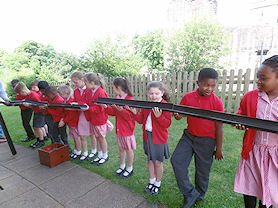 Year 4 completed an investigation about the River Cole to measure the speed of the flow of water. Overall we had a really fantastic day! Year 2 on their way to Oscott College. 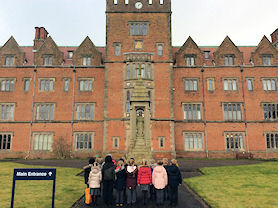 Year 2 visited Oscott College to explore the designs of Augustus Pugin. The children have been learning about the works of Pugin in school and were excited to see them in real life. We all had lots of fun spotting his trademark patterned tiles and were thoroughly awestruck by the beautiful stained glass windows. The children will now continue this work in school by designing their own patterned floor tiles to outdo Pugin himself! Learning about some old modes of transport. 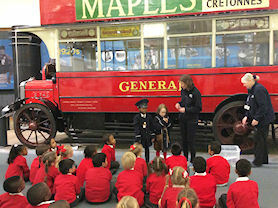 On Wednesday 17th January Year 1 were lucky enough to visit the British Motor museum. Everyone had a wonderful time exploring transport for the first stages of development right up to the vehicles we drive today. We really enjoyed dressing up as people from the past and having a ride of the old London bus! 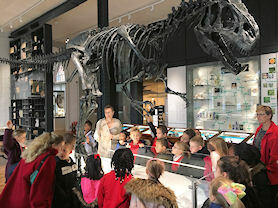 Year 3 had a fantastic, fun trip to Lapworth museum as part of their 'Rocks and Soils' Science Topic. Firstly, we explored the museum in groups observing all kinds of fossils and rocks. We found the Allosaurus dinosaur fossil very impressive and found out lots of interesting facts! After, we investigated the properties of the three main rock types; metamorphic, igneous and sedimentary. We even used microscopes to get a closer look. We are now rocks and fossil experts! 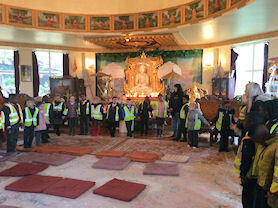 Year 2 had a reflective and enjoyable trip visiting their local Buddhist Temple. 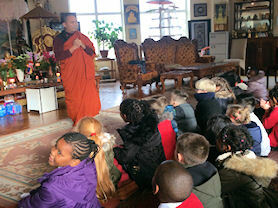 The children were really impressed with the shrine room and enjoyed listening to the story of the Buddha. The children shared their knowledge of the festival of Wesak which they had learnt this half term and the monks were very impressed. 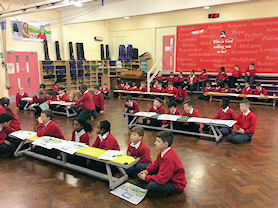 The children particularly enjoyed the chance to meditate and focus on their breathing. A very interesting and peaceful day was had by all! We would like to thank the Buddhist Temple organisers for welcoming us. Admiring a display at the Sea Life Centre. 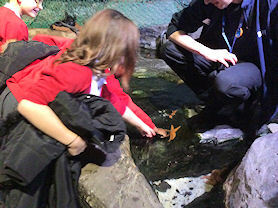 Year 4 visited the Sea-Life Centre in Birmingham as part of their Stories in Pictures topic. We learned about all different types of sea creatures including sea-horses, sting rays, penguins, turtles, sharks and clown fish. it was very exciting and interesting! We also had time to watch a 4D movie where the seats vibrated, we got wet and had lots of bubbles surrounding us. Year 3 down on the farm. 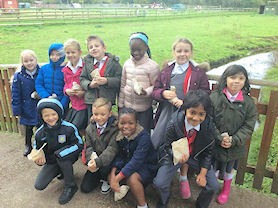 Year 3 had a fantastic trip to Broomey Croft Farm which links to our 'Food Glorious Food' Topic this half term. They all enjoyed feeding the various types of animals, including donkeys, sheep, goats and pigs. We also had the opportunity to go on a bumpy tractor ride which we loved! In the afternoon we completed a treasure hunt where we hunted for different types of leaves, flowers and feathers. Year 4 learn about the Vikings. Year 4 thoroughly enjoyed travelling back to Viking times with Professor McGinty. We learned about many different aspects of Viking life including food, houses, travel and Viking battles. Aaaaaaargh! Year 4 also dressed up as Vikings and examined different Viking artefacts. An amazing learning experience was had by all in Year 4 this morning. 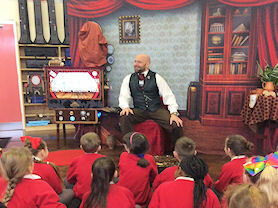 Professor McGinty entertains Year 5. 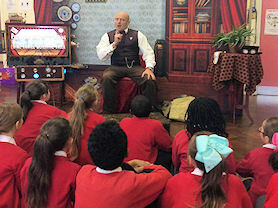 On Wednesday 27th September Year 5 had a visit from Professor McGinty. With his usual inimitable style he entertained and taught us some new things about life in World War Two. We looked at how everyone had to carry and be able to use gas masks; we looked at the daily diet of people and their use of ration books and we investigated the different air raid shelters that the general population had to use. It was a great visit and we look forward to seeing him again! Enjoying the stories at the Black Country Museum. 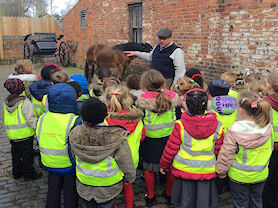 Year 1 had a great day exploring the black country living museum. The children were welcomed by John to discover and play with toys from the past and modern day toys. After our toy workshop it was time to explore some of the homes from the past. We compared these homes to our own and discussed the difference between our homes and theirs. The children loved talking to the characters in the houses and learning more about their lives. The children really enjoyed looking at and feeling old toys and playing with them. Everyone also had a great time travelling in the old red bus around the site. A great day had by all. Year 2 at the Fire Station. Year 2 enjoyed a really informative and exciting trip to Perry Barr Fire Station. The children had chance to explore the different fire engines and got to look at all the different equipment that they hold. 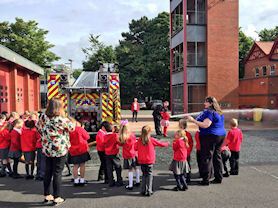 We learnt all about fire safety and the children were impressed by how brave the firemen were. 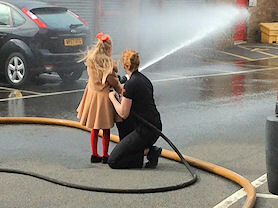 The best part of the day was using the hoses with each child getting the chance to squirt a fireman! The children loved this trip and we want to thank the kind and helpful firemen who showed us around. Year 6 at the Houses of Parliament. On Tuesday 12th September, Year 6 had the opportunity to journey down to London to visit the House of Parliament. 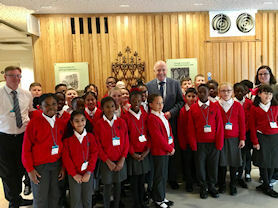 Whilst there the class were taken on a tour, sat in on a debate in the Houses of Commons, took part in a ‘Laws and Debating’ workshop and met our local MP Jack Dromey. It was a fun and exciting day for them – they have lots of memories and facts to share! Roman fun at the Birmingham Museum. 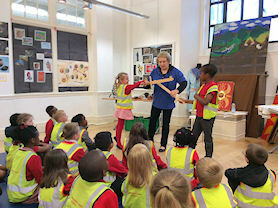 Year 2 had lots of fun in a Roman Army workshop at Birmingham Museum and Art Gallery. We had a fantastic day becoming Roman Soldiers. We were all given Roman names and were taught how to march and what to wear. We learnt about the punishments given out by the Centurions and made battle formations with our shields. Everyone had lots of fun taking part in a victory parade to celebrate our battle win. It was a fantastic day linked with the Colosseum from our Seven Wonders Topic. Year 1 seeing the animals at the Nature Centre. 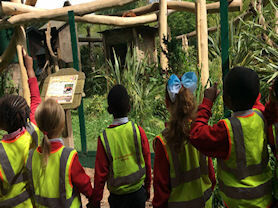 Year 1 visited the Birmingham nature centre. We had a wonderful day exploring the various animals that live at the nature centre, the food they like to eat and what habitats they live in. 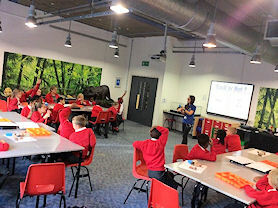 The children were able to use the information they had been gathering recently to answer questions about animals their diets, structures and habitats. The children really enjoyed learning about foxes, badgers, owls, insects and exploring the woodland areas to find minbeasts. It was a great day linking our current topic ‘habitats’ to real life animals and habitats. Year 3 looking for sundials at Packwood House. 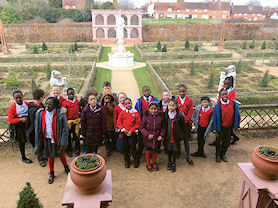 Year 3 visited Packwood House and Gardens in Solihull. We had a guided tour around the different gardens including the Kitchen Garden, Sunken Garden and the Yew Tree Garden. We spotted all the sundials located around the gardens. After lunch we explored the gardens for ourselves! Year 3 enjoying team activities. Year 3 enjoyed a retreat day post First Holy Communion. The theme of the day was team work. Activities were completed in groups which promoted good teamwork; including a chain letters game and a linking the pipes together activity to allow the ball to roll down freely. After lunch, a treasure hunt around the castle grounds to find symbols associated with First Holy Communion, was a highlight of the day. A time for reflection and prayer all together was shared as one family to end our lovely visit. 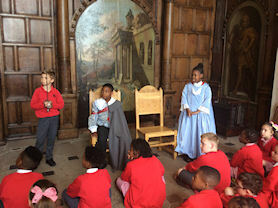 Year 4 dressing up at Aston Hall. Year 4 had a great time visiting Aston Hall as part of their Grand Designs topic. They admired the in depth architectural detail on the walls and ceilings in the Great Hall, and found many portraits of the people that used to live there. They found out a lot of information about what Aston Hall would have been like to live in during the 17th century, with some of them dressing up as the Holte family and their cooks. They walked in the steps of King Charles I as they went up the staircase to discover the bedrooms and the Gallery, where they learned a traditional dance from the 17th century. Many great questions were asked and lots of fun was had by all. 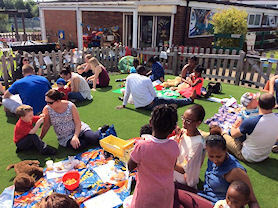 Nursery finished our topic of bears by celebrating with our families with a Teddy Bears picnic. We made sandwiches, decorated cakes and chopped fruit and vegetables to prepare for the picnic. We sang songs for our families and read a bear story together. Year 4 had a fantastic day exploring the ruins at Kenilworth Castle. We learned all about it's defences for battle and we couldn't believe the moat that previously surrounded the castle was the size of 27 football pitches! We found where fireplaces, staircases and toilets used to be, as well as learning about Queen Elizabeth I and her gardens. We recreated a monarch ceremony in the Great Hall and enjoyed our lunch in the sunshine. A brilliant day enjoyed by all. Year 3's workshop on road safety. 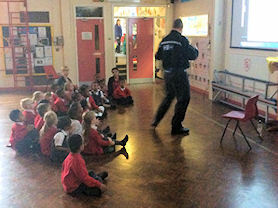 Year 3 had our PCSO visit about Road Safety. We completed a Road Safety Quiz in class and then went out onto Perry Common Road to use a laser to read the speed of passing vehicles. The highest speed we recorded was 38mph. Reception had a visit from PSCO Duncan and we were talking about stranger danger. We spoke about staying safe and not talking to or going off with anyone we don't know. We discussed what a stranger looks like and why it's important to tell an adult we know and trust if we are worried or unsure about someone. 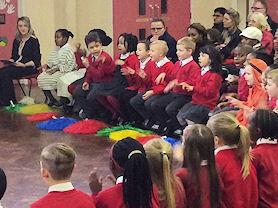 Year 1 welcomed parents in to see their class assembly. We shared work, songs, dances and role plays that we have created in year one. Everyone did a wonderful job. Our teachers and parents were very proud to see all of our hard work and the wonderful topics we have covered this year. Searching for the bear on our hunt. To enrich our topic of 'Into the woods' we took a visit to Kingsbury Water Park. 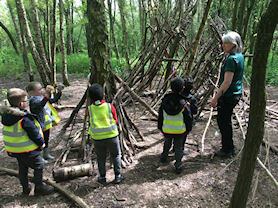 Here we got to explore different parts of the woodland and explore nature first hand through mini-beast hunting, mud painting, building shelters with sticks and digging in the sand. Year 2 at a sunny Alexander Stadium. 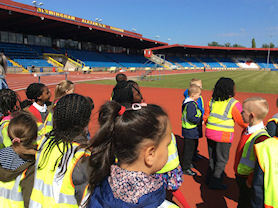 Year 2 visited Alexander Stadium, the home of the Birchfield Harriers. They got to learn all about the present and past Olympians at the running club and learnt how their hard work and determination can lead to success. Year 2 heard about the part played by the Birchfield Harriers in London 2012 and were very excited to stand on the track where many famous athletes have begun their careers. Lots of fun was had by all and we would like to extend a thank you to the Birchfield Harriers for their informative and exciting tour. 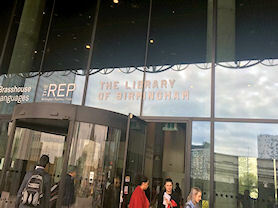 Year 1 visited the library of Birmingham. They went to see the secret garden, Shakespeare room, children’s library and the gallery. From the secret garden they could see the view of the city of Birmingham, such as different types of buildings and the canal. They drew pictures of what they could see from this view. The children were exceptionally behaved and the general public commented on how sensible they were. Year 6 at Cadbury World. 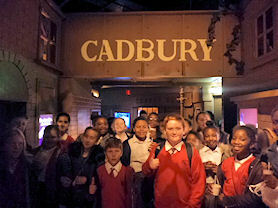 Lots of fun was had by all when Year 6 went to Cadbury world. First, the children went to a really useful and informative workshop about Fairtrade. Following this, the children got to enjoy the bit they’d all been waiting for – chocolate! A really lovely trip and we’d like to thank Cadbury World for a great time. Year 2 children outside Soho House. 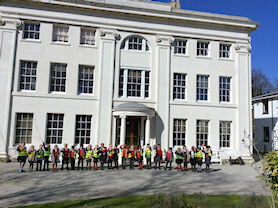 Year 2 went on a special trip to Soho House today where they enjoyed learning all about Mary Seacole. Our Education officer was really helpful and the children took part in a Mary Seacole Role Play complete with traditional costumes. 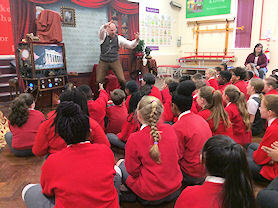 Following this, the children had a chance to explore Matthew Boulton’s Georgian house and get a feel for the time that Mary was alive. Finally, the children loved exploring the Gardens and the weather was perfect for it. Professor McGinty tells Year 3 about the Romans. Year 3 has a special visit from Professor McGinty. The session was centred around the current topic in Year 3 - The Romans. The children got to dress like the Romans and explore the different roles in Roman Society. Professor McGinty made the session fun and engaging and we learnt so much as a class! Orienteering at the Botanical Gardens. 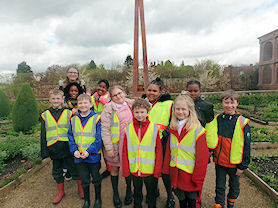 Year 5 went on an exciting trip to the Birmingham Botanical Gardens. They had to use their orienteering skills to navigate around the different areas. As our current topic centres on the Rainforests, we really enjoyed exploring and investigating the plants in the Tropical Rainforest Area. A really fun and interesting trip! The Fire Fighters speak to Year 4. Year 4 enjoyed an interesting visit from some Perry Barr Fire Fighters. 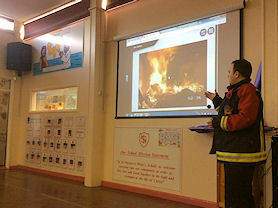 Josh and Lee visited to teach Year 4 all about fire safety. We now have a better understanding of the different causes of fire and how to prevent these. The most important thing we learnt was the ‘stop, drop and roll!’ technique and we had lots of fun practising this. Thank you Perry Barr Fire Fighters. 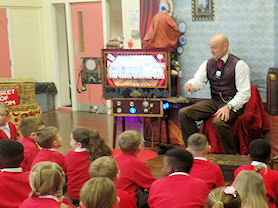 Year 1 go back to Victorian times. Year 1 went on a trip back in time at Black Country Museum. We spent the day exploring transport through time and what modes of transport were used over 100 years ago compared to what modes of transport we use today. The children got to ride on a traditional red double decker bus and really enjoyed their visit. Learning about Road Safety Workshops outside. 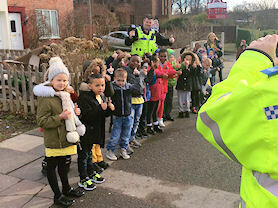 Key Stage 1 were visited by some very helpful PCSOs who taught the children all about Road Safety. We took part in a road safety quiz which tested our knowledge of how to cross roads safely. We know how to stop, look and listen. We also got to go outside to investigate the traffic outside our school. We used the special laser to check car speeds. It was very exciting! Thank you to our PCSOs for fun and informative workshops. Year 6 listening to the vocations talk. 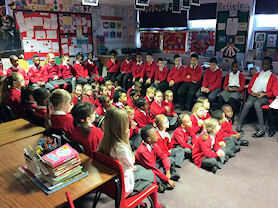 On Monday 6th February the children in Year 6 received a visit from Christie. She came from Oscott College to talk to them about the importance of Vocations. 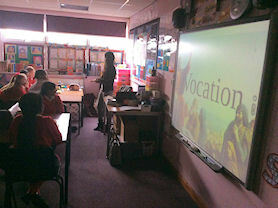 A focus in RE this year is on the importance of Vocations. Christie spoke about a ‘calling’ from God. We can have a religious calling, a calling to marriage or to be single. 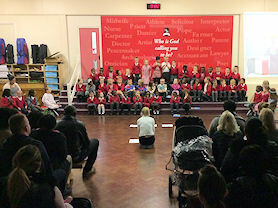 On Friday 3rd February the children in Year 2 presented their class assembly to their grown-ups. Year 2 told their loved ones all about the topics they have been studying, the songs they been singing and all the fun they have had in Year 2 so far. 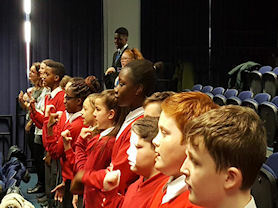 On Friday 3rd February the Confirmandi children in Year 6 visited Cardinal Wiseman Secondary School for a Confirmandi Mass. This Mass marks the start of the preparations for Year 6 towards their Confirmation. They joined their friends from Christ the King and Maryvale for this special event. Lottery winners enjoying lunch with family members. 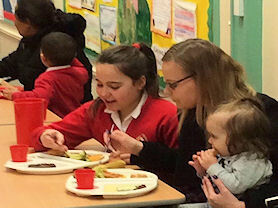 On Monday 30th January the winners of this half term’s lottery lunch were invited to school. The winners and their adults enjoyed a delicious, healthy lunch from our wonderful cooks. House groups listening to their House Captains. On Monday 23rd January all children in St. Margaret Mary's School listened to a presentation from their House Captains. Children travelled around the school and gathered together in their House Groups. The House Captains then spoke about the next fundraising day that is coming up for St. David’s Day Celebrations. On yellow day, there will be a ‘fun day’ to raise money for Father Hudson Care. 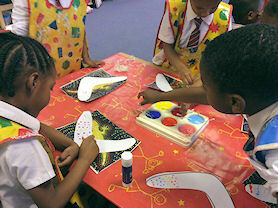 On Friday 20th January all children in St. Margaret Mary's School took part in activities to celebrate Australia Day. Classes explored the landscape and history of Australia; they listened to samples of music from Australia and got creative through art sessions. Working hard trying to solve the problems. On Tuesday 17th January Year 5 and 6 took part in our first Maths Assembly of 2017. The children took part in a variety of maths activities, such as: money problem-solving, reasoning to explain their answers and geometry tasks. Year 5 and 6 worked very hard to solve these problems! 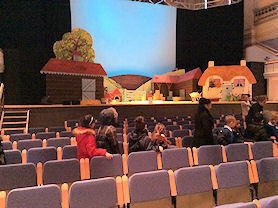 On Friday 13th January the children in Reception went to the theatre. The children really enjoyed their theatre trip to see ‘What the Ladybird Heard’. They said that they had "lots of fun!"